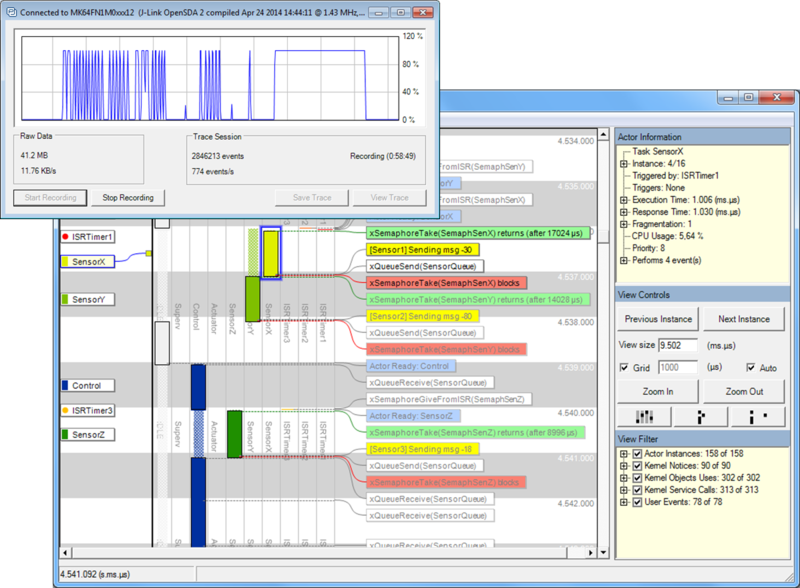 Percepio AB, the Swedish developer of RTOS visualization tools, today announced the availability of Tracealyzer v3.0, initially supporting FreeRTOS and SEGGER embOS. The new generation Tracealyzer offers continuous trace streaming, allowing for essentially unlimited traces of task scheduling, interrupts, and application logging. Trace streaming is supported via SEGGER J-Link debug probes, which offers great performance, on ARM Cortex-M and Renesas RX microcontrollers. Trace streaming is also supported via network connections and to device file systems, on any RTOS-supported processor. According to Percepio founder, and CEO Dr. Johan Kraft, “Continuously streaming trace is a fundamental improvement. Developers can now record their system for hours using a standard debug probe, capture intermittent problems, visualize and quickly understand why they occur. The new version 3.0 is also the foundation for a whole new set of powerful features that will be released during 2016. Percepio’s market-leading visualization offers 20+ views, which are cleverly interconnected to allow viewing the trace from multiple perspectives, for instance CPU usage, memory allocation, task synchronization and communication events, as well as selected state variables and input/output values. The insight provided by Tracealyzer facilitates debugging, validation, profiling, documentation and training. This can help avoid weeks of troubleshooting and vastly increase development speed. FreeRTOS is the market leading RTOS from Real Time Engineers Ltd. that supports 35 architectures and received >113000 downloads during 2014. It is professionally developed, strictly quality controlled, robust, supported, and free to embed in commercial products without any requirement to expose your proprietary source code. FreeRTOS has become the de facto standard RTOS for microcontrollers by removing common objections to using free software, and in so doing, providing a truly compelling free software model. In 2011, Percepio was awarded “Innovator of the Year” by the city of Västerås, Sweden. Tracealyzer for FreeRTOS v3.0 is available for download below. Windows and Linux hosts are supported, the latter requires the Mono framework. We provide free evaluation and also feature-limited Free Edition. The download supports all licenses and also includes the required trace recorder library. To learn more about Tracealyzer, check the product pages and the licensing page.